Roofab sheets make good sense for their aesthetics. They come in attractive colours, last longer and have extraordinary strength, among other qualities. Roofab makes perfect economic sense too as they are available in various shapes and sizes suitable for you. This means, you save a lot on time and costs in the long run. Roofab sheets are available in any tailored length in standard width of 1.10m ideal for factories, bungalows, sheds, workshops and other constructions like airport hangers, warehouses, farm houses, marriage halls etc. Roofab comes to you from one of the most trusted names for metal roofing - ASB Roofings INC.
Roofab sheets must be kept dry and stored clear off the ground and under cover in order to prevent water from being trapped between sheets. If this has happened the sheets must be immediately dried and placed separately to allow air circulation to complete the drying processes. The procedure is necessary to avoid the possible damage to surface coating. During and after installation of Roofab, all metallic or metallic based materials such as nails, screw, iron scrapes and fillings must be removed from roof surface immediately and cleaned with a soft broom to avoid oxidation and rusting on the surface coating. 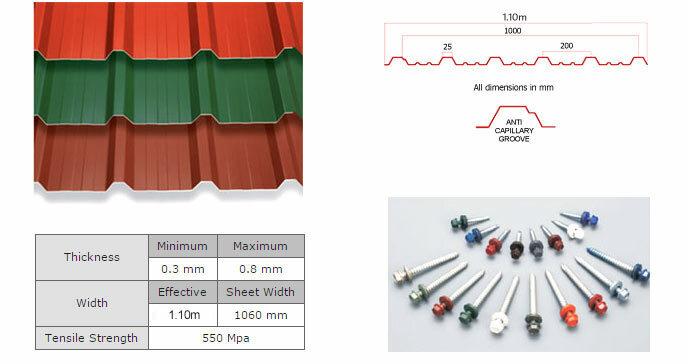 It is advisable to use Non Corrosive coated self threading screws while installing Rooftab as the sheets last longer when compared to sheets installed with ordinary steel self threading screws.